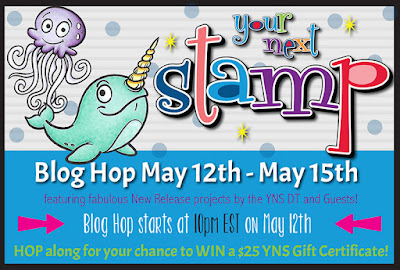 Hollybeary Creations : YNS May Release Blog Hop!!! 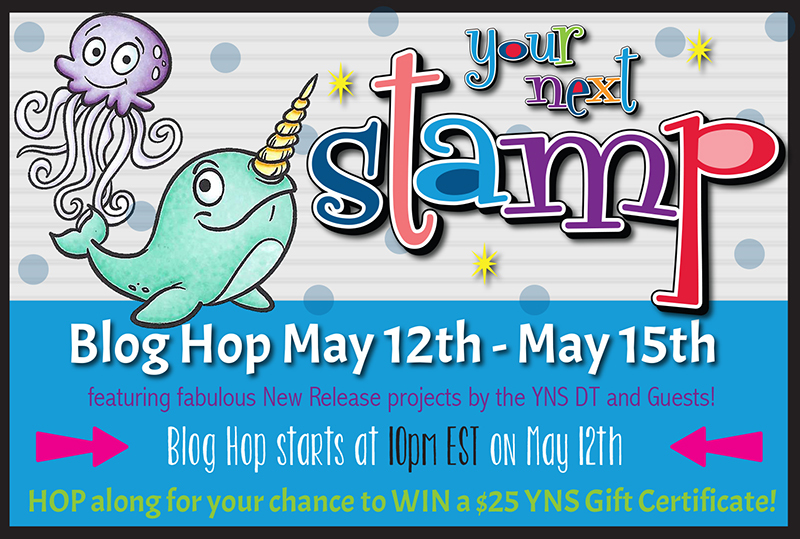 YNS May Release Blog Hop!!! It's time for the May Release Blog Hop are you ready to see all the new products? 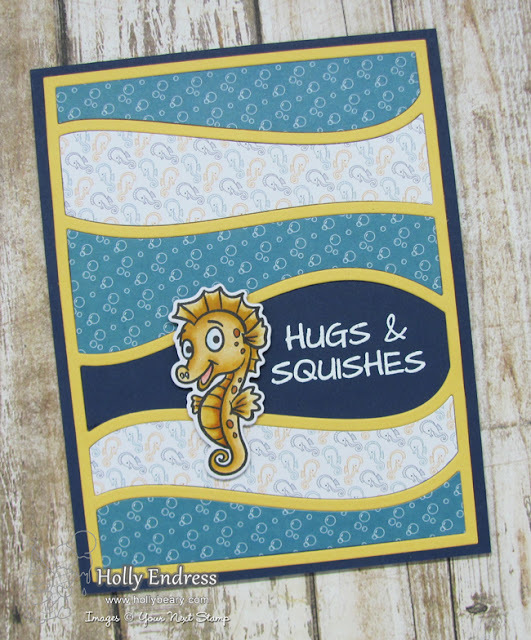 I'm sharing two projects for the Hop the first one features the new stamp set Sea Friends and the new Tiny Sliders Die Set. I created a background with some Distress Inks on a piece of watercolor paper and then I die cut the panel with the stitched rectangle die and the new Tiny Sliders die set. I stamped the sentiment in Black Olive Ink. I added a double layer of foam adhesive to the back of the panel. Then I used some small sliders and small circles die cut from some scrap cardstock to create the slider element. 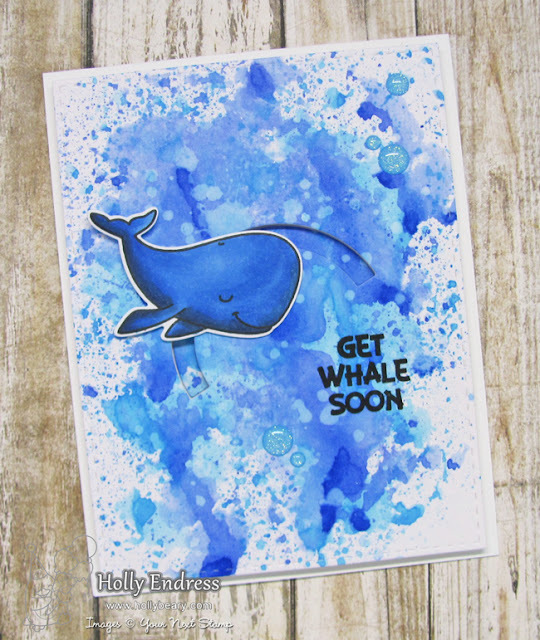 I stamped the whale image onto some X-Press It blending cardstock and colored it in with Copics. Then I adhered it to the slider element I created and adhered the entire panel to the card base. For a touch of sparkle, I added some of the Watermelon Party Gumdrops. My second project shares the new Wave panel die, Seas the Day 6x6 Paper Pad and the Super Cute Totally Narly Stamp Set and Coordinating Dies. I cut the die three times from two pieces of the Seas the Day patterned paper and a piece of Yellow Cardstock. I adhered the panel to a Navy card base. Then I heat embossed the sentiment in White inside the center wave. I inlaid different pattern of the papers inside the wave die-cut as well. I stamped and colored the image with Copics and used the coordinating die to trim it out. I adhered the image to the front of the card with some foam tape. Be sure to leave comments along the way as you Hop for a chance to Win a $25 GC to the store. And we have a Special in the Store right now too, so head over and pick up your Favorites from the Release and More!!! Both cards are adorable, Holly! Lovin' these little ocean critters. Cute little whale! :) Awesome cards! Fabulous cards! That inked background is perfect for your underwater card and sure to make anyone feel better! Love the new paper and the cards are great! Great cards Holly! The yellow frame pops against all the paper and the whale card is watery and fun. Just love both of your cards. Great designs! Your cards are beautiful ! I love the colors as well as your choice of paper for the second card, the result is awesome ! Two creative cards! Love both backgrounds! background in the first is great. Really sets off the whale. AH! These are amazing! I love the Whale one the most! That background is so cool! Adorable cards! I love the background with the Distress Inks. I love the Seas the day paper pack! Your cards are adorable! Love the seahorse! I love all the new products! Will be great for cute summer cards! Love the background on the whale card and the papers on the sea horse card. Love your cards. The background on the whale one is awesome. Cute sea creatures! I love the interactive element. Your little seahorse card is so cute!! I really like the way you used the designer paper in the waves. Fintastic set of cards! I SO love nautical themed craft supplies! yay!